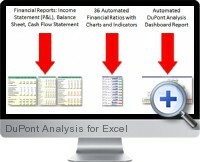 DuPont Analysis for Excel (Financial Dashboard) is a set of prebuilt Excel templates allowing DuPont analysis to be automatically generated from standard financial statements data. Standard templates are provided for income statement, balance sheet and cash flow statement from for which data can be copied in or linked from external data sources. A DuPont analysis dashboard and financial ratio analysis dashboard updates automatically to the underlying data. Excel templates are provided for standard accounting statements including income statement, balance sheet and cash flow statement. Key financial ratios and business metrics automatically show performance information for the business over the past five years. The most common and important financial ratios are presented in tabular and chart format for financial analysis, planning and reporting. An executive summary dashboard report highlights financial trends for the most critical information for management decision making. The DuPont analysis provides a visualization of the relationships between the financial ratios and metrics to quickly and clearly understand causal relationships of business performance. All reports and dashboards are designed to print in high quality for publishing. The financial dashboard with DuPont analysis includes lifetime updates and access to tips and materials for business improvement through financial dashboard reporting.